Are you giving a relationship another try? It can be confusing as you try to reconcile the issues you had the first time, but it doesn't mean your relationship is doomed to fail a second time. Dating coach Lori Gorshow has some expert tips for navigating another try. Should you start fresh as though the previous relationship never happened, or should you carefully analyze the mistakes that were made and vow to avoid them? While there is no way to guarantee success, the answer depends largely on your circumstances. If your first attempt at a relationship ended badly, you can't simply act as though it never happened if the two of you haven't yet reconciled what happened. Gorshow suggests that intentionally building a new relationship can work as long as you're both in agreement. "The suggestion that the two of you, in a sense, start over and try to normalize your relationship and build a foundation like the one most couples do is a good idea," said Gorshow. "Not only would this give you an opportunity to demonstrate your commitment to the relationship, but it also gives you both a chance to learn how to be a couple. Think about the opportunity you are gaining by being given a second chance as a couple." Sometimes the instinct in a "second time around" relationship is to skip over the romance that is typically prevalent in new relationships. It's easy to fall into a lull quickly and doesn't set the stage for a solid relationship. "Spend time together as a couple, running errands, cook together, etc., but don't forget to share your thoughts, hopes, and dreams," said Gorshow. She stresses the importance of time together and open communication. Consider your previous attempt at a relationship to be to your advantage. You already know the little nuances that lead to frustration (Does he hate when you put your elbows on the table or is she a stickler for laundry not being left on the floor? ), so you're already ahead of the game when it comes to figuring out your significant other. You can skip past the growing pains characteristic of two people getting to know one another, and this can set the stage to getting right to the foundation-building that leads to a solid relationship. If your first attempt at a relationship was when you were younger, it's important for you both to realize you may not be the same people you once were. The end of your first relationship might have been more about maturing and growing as opposed to non-compatibility. "You may have had a good thing for a while, but over time, feelings changed," said Gorshow. "It wasn't because you did something wrong; it was because one of you discovered that feelings changed." Take the time to get to know one another all over again so you're in a relationship with your current partner instead of who he or she once was. Gorshow recommends putting extra effort into a reuniting when it happens from across the miles. "My suggestion is to go back to the 'old school' of romance and write letters," suggested Gorshow. "The key is how you write the letters. Try writing handwritten notes and intersperse these with emails. One of the most romantic things a guy can do is handwrite a note. I don't know why, but most if not all women find handwritten letters the epitome of romantic. The key to writing a letter is not to overtly flirt or be sexually intimate. The key is to write in a way that professes your deep commitment, love, and dedication to the other person. Believe it or not, you can do this simply by writing about the 'every day, the boring and the reality.'" 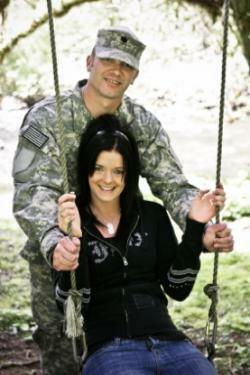 Couples rekindling a romance while one of them is serving a deployment or is stationed far away have special considerations since the element of danger might be a factor. "Some of the best romantic movies have themes that are set during war, espionage, or some other battle," said Gorshow. "Watching these epics, one can't escape watching the intense desire and passions the couple shows one another. Each person seems to throw caution and inhibitions to the wind in favor of living in the here and now. The fear of losing a partner forever is an aphrodisiac like no other. Unfortunately, the audience never sees what happens to this romantic couple after the war ends and the hero goes home. This is because the 'everyday' stuff that all relationships experience is not nearly as exciting or romantic." As such, when the couple can physically be together they need to make the effort to stay romantic and excited to be in the relationship. You've already experienced an ending to your previous relationship, so you probably can recognize when the second relationship is on the decline. Once you notice old patterns reemerging, you can take steps to either fix what's wrong or walk away again. "If your relationship is continuing to deteriorate and neither of you is happy, my advice to you is let go. Move on," advised Gorshow. If you choose to instead fix the issues and stay together, you may experience a much tighter bond and a stronger relationship than ever.